In our last blog post, we saw how to get extended opening statistics from a ChessBase 11 tree. Today we’ll look at the numbers themselves, as well as an additional (and very useful) statistical display. Put a check in the box beside “Default book”; now CB11 will use the Powerbook automatically when any functions involving the opening book are invoked. We’ve previously examined and described the statistics which appear in the opening tree. In this post we’re going to focus specifically on the success rate percentages. The default view always shows the statistics from White’s viewpoint, meaning that success rates closer to 100% are better for White while percentages closer to 0% are good for Black. This can be changed (and I’ll show you how in a minute), but we need to first take a short detour to learn how these percentages are derived. In the most basic form the percentages are just straight statistics. For example, if in the present position the move 6.h4 had been played just four times and White won three of the games, then the success rate would be 75% (White wins score as 100’s, Black wins as zeroes; thus 100×3 = 300 and 300/4 = 75). That’s easy enough to understand. Now let’s say that six more games are played and all of them were draws. Drawn games are scored as 50%. So it would be 100×3 = 300, and 50×6 =300. Adding these together we get 600, and then dividing by the total number of games (ten) we get 600/10 = 60, for a final success rate of 60%. Simple stuff, but then we also have to factor in the database games which end in an evaluation symbol (such as +/=) instead of in a result. 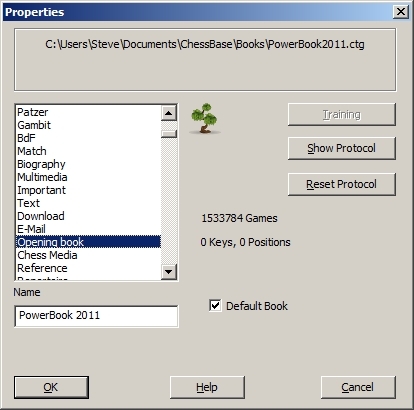 These games (usually the result of an analysis or an opening overview, such as you’ll find in the ChessBase Opening Encyclopedia) also get factored into the final percentage; each Informant-style evaluation symbol which favors White scores a result between 60% and 90% (depending on the symbol), while the symbols favoring Black conversely score between 10% and 40%. Now that we’ve seen how the numbers are derived, we can go back and look at the statistics for the White sixth move replies after 1.e4 c6 2.d4 d5 3.Nc3 dxe4 4.Nxe4 Bf5 5.Ng3 Bg6 (in the previous illustration). All of the moves with percentages in normal typeface show statistics relatively close to 50%; some are a little better for White, some are a little better for Black, so there’s nothing earth-shattering here. 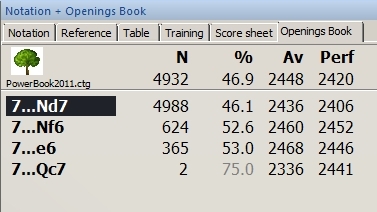 The last three moves have success rates which are displayed in half-tone (that is, “greyed out”), which means that there weren’t enough games played to constitute a valid statistical sampling. We notice that the top three moves have a valid statistical sampling due to the number of times they were played. Remember, though, that in the default view the percentages are always given from White’s viewpoint. Even though the percentage figure for 7…Nd7 is higher than the other two moves, this is statistically the worst move for Black of the three moves shown. For many years, this was the only display option for ChessBase opening trees, and this sometimes threw players for a loop; users would occasionally forget that the numbers were always given from White’s viewpoint and would misevaluate moves. So ChessBase now gives you the option to always display statistics from the viewpoint of the moving side. The statistics are now being displayed from the viewpoint of the moving side. 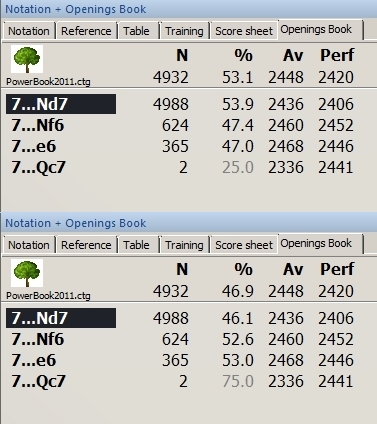 So it’s now plain that 7…Nd7 is not statistically the best move for Black in the position. The upper half of the illustration shows how the statistics appear with “Result from White side” checked while the lower half shows what they look like with the box unchecked (so that the numbers always reflect the result from the moving side’s point of view). Obviously, the choice is yours – just remember which you’ve selected so that you don’t make a mistake when using the opening tree for statistical analysis. If you’re unsure, you can always select “Properties” and double-check which way you’ve set the tree. The colored bars show the exact number of White wins (green bar), draws (grey bar), and Black wins (red bar) for the move selected. This is not just a great visual indicator of the relationship of the three results, it also ignores games which end in evaluation symbols, and it’s often more informative than just the raw numbers provided by the main tree. There’s a big different between, say, the above illustration (with many, many draw results) and one which would show a predominance of decisive results (wins for either side) leavened with a few draws but which still results in a 53.9% success rate for White. In the former case, we can assume that the position is “drawish” and that a decisive result isn’t generally likely to happen unless one player commits a blunder or is otherwise outplayed. 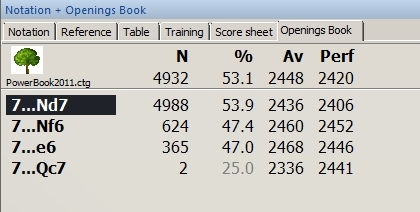 A 53.9% result with many wins and few draws, though, generally indicates a much more dynamic position which has more “play”, and the fact that decisive results are common means that the opening bears close and cautious examination and study before you try to play it. ..with the two ratings separated by a dash. As always, these numbers will change as you step through a tree (or game), always reflecting the statistics for the currently highlighted move. Copyright 2011, Steven A. Lopez. All rights reserved.